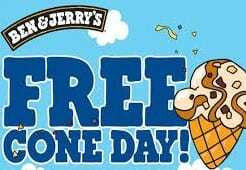 Ben & Jerry’s Free Cone Day on April 8, 2014! Mark your calendars! Ben & Jerry’s annual Free Cone Day is THIS TUESDAY, April 8, 2014 from 12-8pm! No coupon or purchase needed! To find a participating location or for more information, please head here! Yum!